Trinicom Communications has positioned itself with local upstream internet providers to bring you the best interconnectivity and quality as compared to other Internet Service providers in the Houston Area. Trinicom Communications, LLC owns and manages our own fault tolerant NOC (Network Operations Center) in North West Houston, Texas. We have two different metro fiber optic carriers delivering geographic directional diverse feeds allowing us to tap into the full power of the fiber optic grid to deliver high levels of service for all of our clients. We have built our NOC with redundant cooling, secure access, 24 hour monitored security systems, infrared video cameras, raised flooring, 60,000 watt diesel generator, and Speak BG4, load balanced and fault tolerant routing. Our networking and DS3 T1 routers are all CISCO with additional hot spare routers in case of any failures so we have everything on hand. At Trinicom, our hosted phone system servers are powered by Asterisk running on Linux servers (the most trusted operating system for internet applications). We chose Asterisk because it is a feature-rich platform with frequent updates that allows Trinicom to provide the most current telecom technologies to our clients. Asterisk also has a huge install base which has proven Asterisk will stand up to the most crucial business needs. 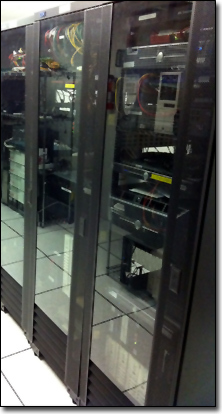 Since its implementation on our custom built RAID based servers, our uptime has been 100%. Not only has Trinicom invested in our NOC, we have also brought in highly-trained personal to provide you with the highest quality services possible. Our network engineers are talented in the arts of Cisco routing, Linux and Telecom technologies. We cover your entire hosted Phone system for you, from help desk issues on the phones themselves, to any connection carrier issues through out the world. Since our engineers have complete control of our NOC, we are not at the mercy of an other vendor in designing, executing and managing mission critical solutions for our clients. Please contact us for a free a consultation in Houston at 713-838-0038 or toll free at (888) 896-1653 or by email at sales@trinicom.com.